Elysian Park is a neighborhood in Central Los Angeles, California, encompassing Chavez Ravine, with a mostly low-income community of 2,600+ people. 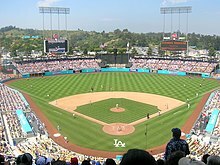 Besides the city park of the same name, Dodger Stadium is also located within the neighborhood, as are a Catholic high school, an elementary school and the Los Angeles Police Academy. The southeastern corner of the park is near the Los Angeles River at the location where the Portolá expedition gave the river its name in 1769. The first Europeans to see inland areas of California camped near this spot on August 2, and California Historical Landmark #655 ("Portolá Trail Campsite") is located at the Meadow Road entrance. The park is the second largest park in Los Angeles at 600 acres (2.4 km²). It is also the city's oldest park, founded in 1886 by the Elysian Park Enabling Ordinance. It hosted shooting as well as the shooting part of the modern pentathlon event for the 1932 Summer Olympics. 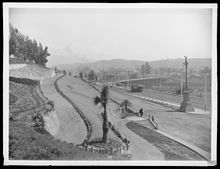 In 1964 the Citizens Committee to Save Elysian Park was founded to prevent the City of Los Angeles from constructing the Municipal Convention Center on 62 acres (250,000 m2) of park land. In 1968, it hosted a hippie "Love-In." 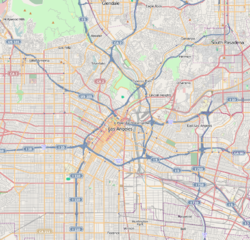 According to the Mapping L.A. project of the Los Angeles Times, the Elysian Park neighborhood is flanked on the north and northeast by Elysian Valley, on the east by Lincoln Heights, on the southeast and south by Chinatown and on the southwest, west and northwest by Echo Park. Street and other boundaries are: the northern apex at Exit 138 of the Golden State Freeway, thence southeasterly along the freeway, southerly along the Los Angeles River, westerly along North Broadway, northwesterly along Stadium Way, Academy Road and northerly along Elysian Park Drive. The Figueroa Street Tunnels take northbound State Route 110 (the Pasadena Freeway) through the park. Solano Canyon is a canyon within Elysian Park and also the name of a residential district at the southern extremity of the Elysian Park neighborhood, directly north of the Los Angeles State Historic Park. The district is bisected near its southern tip by the Arroyo Seco Parkway, and it shares a border with Chinatown (Los Angeles). 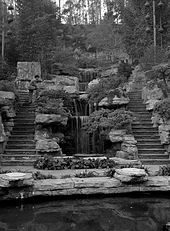 Solano Canyon was also an old name for a ravine in the Hollywood Hills that was later named Runyon Canyon. 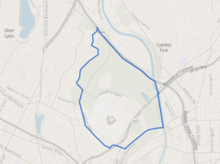 The 2000 U.S. census of the Elysian Park neighborhood counted 2,530 residents in its 1.65 square miles, which includes all the city park land as well as Dodger Stadium—an average of 1,538 people per square mile, one of the lowest population densities in Los Angeles county. In 2008 the city estimated that the population had increased to 2,659. The median age for residents was 31, about average for Los Angeles; the percentage of residents aged 11 to 18 were among the county's highest. The neighborhood was moderately ethnically diverse. The breakdown was Latinos, 47.6%; Asians, 43.4%; whites, 3.1%; blacks, 2.1%, and others, 3.7%. China (32.3%) and Mexico (27.3%) were the most common places of birth for the 54.4% of the residents who were born abroad, a high figure compared to rest of the city. The median yearly household income in 2008 dollars was $28,263, low for Los Angeles; a high percentage of households had an income of $20,000 or less. The average household size of 3.1 people was high for the city of Los Angeles. Renters occupied 81.9% of the housing stock, and house- or apartment owners 18.1%. Thirteen percent of the neighborhood residents aged 25 and older had earned a four-year degree by 2000, an average figure for the city. Cathedral High School, private, 1253 Bishops Road. 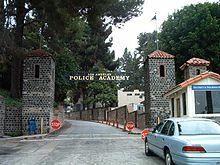 It was founded by Archbishop John Joseph Cantwell as the first Los Angeles Archdiocesan high school for boys in fall 1925. The Christian Brothers have operated the school since its opening. It was designated Los Angeles Historic-Cultural Monument number 281 in 1984. ^ a b Smith, Doug (December 21, 2015). "Recovery plan lies dormant as Elysian Park's exotic trees die off". Los Angeles Times. Retrieved February 4, 2017. ^ 1932 Summer Olympics official report. Archived July 7, 2010, at the Wayback Machine p. 74. Solano Canyon can be seen on the horizon of this 1873 photograph, labeled No. 50, as published in "The Story of Fifty Years: Where the City: In Which Southern California and the Los Angeles Times Grew Up Together," Los Angeles Times, December 4, 1931, page E-3.